It’s not exactly an austere art gallery environment. The walls are painted vivid colors, in keeping with the palette and imagery of the fanciful art displayed. The rooms resound with pinball pings and clangs. 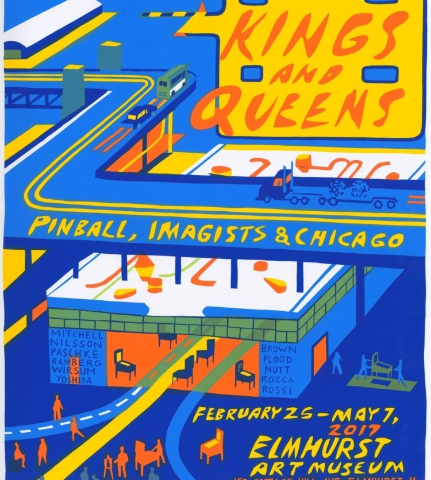 But a trip to Elmhurst by train or car will have great benefits for fans of pinball machines or Chicago Imagist art. 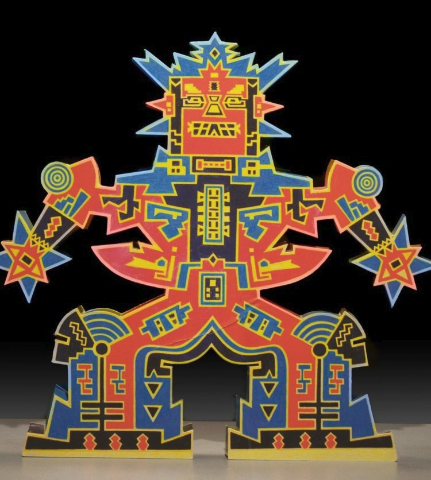 The Elmhurst Art Museum has mounted an exciting exhibit that will intrigue and amuse you and give you new insights into Chicago’s reputation as a center for creativity—and pinball machine manufacturing. Kings & Queens: Pinball, Imagists and Chicago is the new exhibit at the museum, which sets 16 working vintage pinball machines in several galleries with about 30 pieces of art by the pioneers of 1960s and ‘70s Chicago Imagists: Ed Paschke, Karl Wirsum, Suellen Rocca, Ed Flood, Jim Nutt, Gladys Nilsson, Christine Ramberg, Roger Brown and Ray Yoshida. The connection, of course, is that the artists were influenced in childhood and adolescence by the art of pinball machines and comic books. 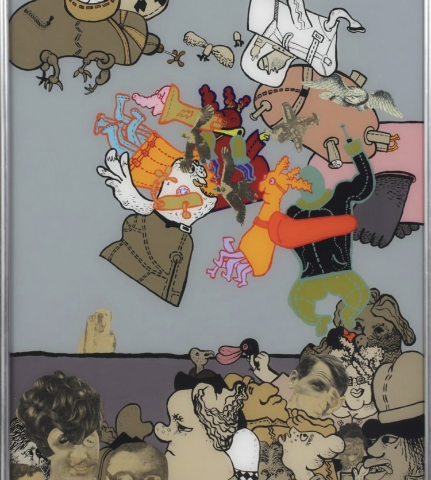 Some of the highlights of the Imagist work exhibited are Brown’s whimsical “American Buffalo—An Imaginary View of Chicago the Prairie” (1982); Rocca’s “Cho Cone” (1966); Ramberg’s alluring “Black Widow” (1971); Paschke’s “Cobmaster” (1975); Nutt’s “Officer Doodit” (1968) and several Wirsum pieces, such as the sculpture “Zing Zing Zip Zip” (2003). In vivid colors and lurid imagery, they show the influences on the artists’ work. There also are several works by Constantino Mitchell, a designer who created many of the art works for the machines. Four of his machines and four of his paintings are included in the exhibit. Ed Paschke’s personal pinball machine, Gorgar, is also on display (but has a Do Not Touch sign). 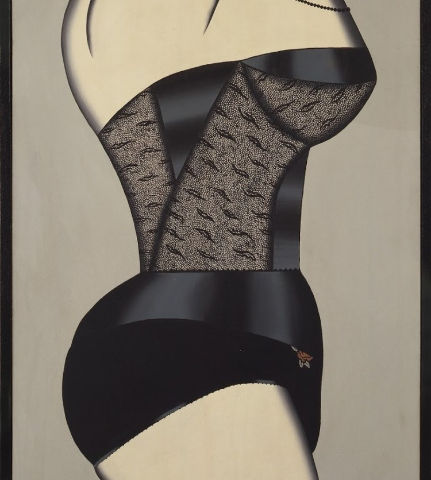 Mitchell and Paschke were both students at the School of the Art Institute of Chicago and studied under Yoshida, who introduced them. Their 1982 show at the Chicago Cultural Center—Flip! Flash! Pinball Art—their definitive homage to pinball machines—inspired the current Elmhurst show, according to curator Dan Nadel. 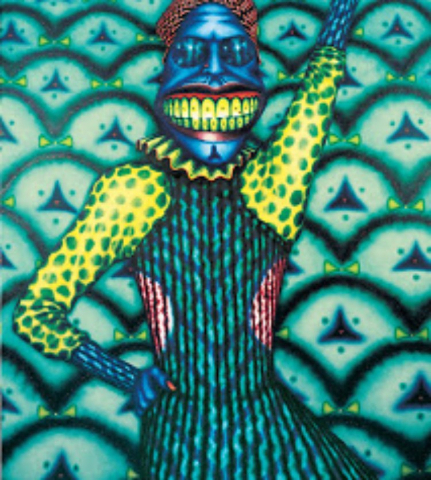 Today Paschke, who died in 2004, is probably the best known of the Chicago Imagists and a fine exhibit of his work can be seen at the Ed Paschke Art Center, opened in 2014. In addition, Elmhurst College, where Imagist artist Suellen Rocca is curator and director of exhibitions, has a large collection of Paschkes and other Imagists. Chicago was the pinball machine capital of the world and probably still is, according to Jim Schelberg, the pinball machine collector who loaned many of the machines on display. (And by the way, most of the machines are working and you can play away for only a few quarters.) On the day the exhibit opened, Schelberg was there to participate in the panel discussion (more below) and also brought his tool kit to get some of the machines up to speed for play by adults and kids. Gottlieb & Company was one of the original pinball machine makers. (The Alvin Gottlieb family lived in Elmhurst and his parents founded Gottlieb Memorial Hospital in Melrose Park.) Other early companies were Williams Electronics and Bally Manufacturing Corporation. We had a chance to talk with John Borg, a game designer who works for Stern Pinball in Elk Grove Villege, about the process used now. The newer games are more high tech and usually more complex but still provide the same whiz/bang/clang fun of the vintage models. Stern was the design lead for a new pinball machine designed to highlight the band Aerosmith, based on their album, Toys in the Attic. He also described an earlier rock-band game, created for Metallica. The company builds games that build on pop culture phenomena, such as games titled Game of Thrones, the Walking Dead and Ghostbusters. The panel discussion on the exhibit opening day was moderated by curator Dan Nadel. Participants were artists Suellen Rocca and Karl Wirsum; and pinball collector and curator Jim Schelberg, editor and publisher of the PinGame Journal. The museum lobby area was standing room only with both pinball and art enthusiasts eager to tell of their pinball and art obsessions and experiences and ask questions of the panel experts. Rocca described how many of her paintings—including “Cho Cone”—were rolled and stored for years and only recently restored to exhibit quality. Constantino Mitchell, pinball machine artist, also was present and contributed to the discussion. 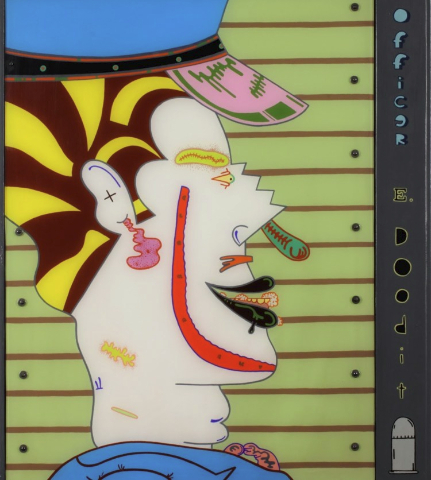 The colorful history of the Chicago Imagists—and its subgroups the Hairy Who, the Nonplussed Some and False Image—is presented in a 2014 documentary, The Hairy Who and the Chicago Imagists. The film will be screened at 6pm Friday, March 31, at Elmhurst College. Rocca will introduce the film and give a tour of the college’s Imagist art collection afterwards. The exhibit runs until May 7. The Elmhurst Art Museum is at 150 Cottage Hill Ave. in Elmhurst. The museum is open daily except Monday. Hours are 11am to 7pm on Fridays and 11am to 5pm other days. Admission is $9 for adults; students and those 18 and under are admitted free. Admission is free on first Fridays! That would be tomorrow, March 3. Photos courtesy of the Elmhurst Art Museum, except as noted. Reposted by Nancy Bishop and Third Coast Review.